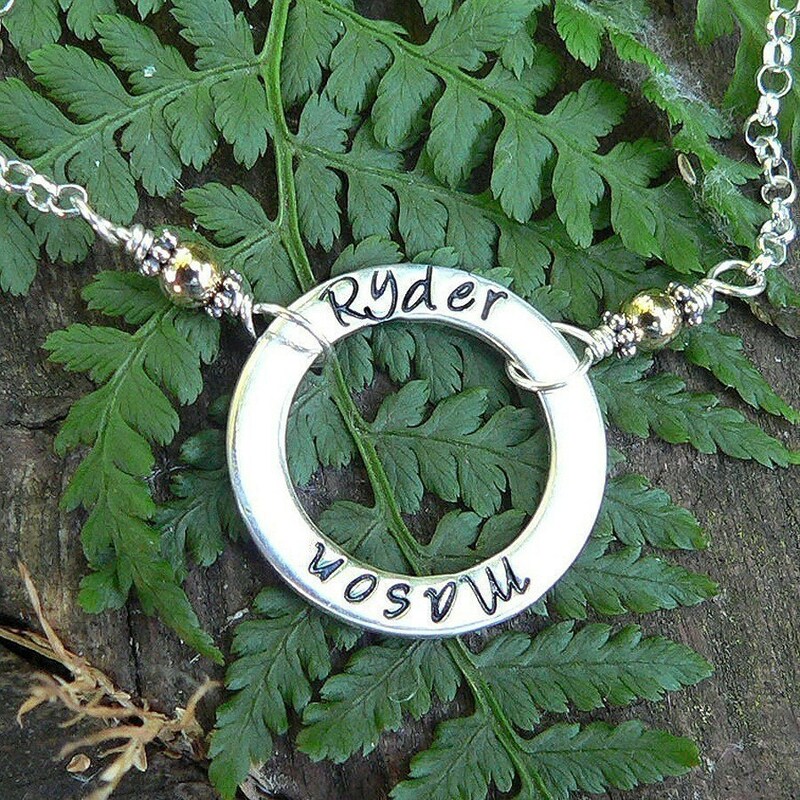 By popular demand, we are now offering our best-selling Mother's Circle necklace (first offered in 2003!) in our trademark, simple "doubled chain" version. We can usually fit about 25-35 characters - including spaces - depending on font. The piece is stamped in a clockwise manner, as it is freely moving and not fixed upon the necklace. That way, no matter how the pendant is orientated, there is continuity and fluidity to the names and/or dates. Necklace length can be chosen. Our necklaces are hand-hewn in our studio from milled silver chain. We never use jump rings in our basic construction - every necklace or bracelet has a hand-looped secure closure with accent beads...it won't just fall apart. Our hand-sawn, pierced, filed, stamped, and/or oxidized pieces have been forged with proven, classic techniques that may take a little more time, but show the heirloom quality of our work. The "circle" pendant is a 1mm thick cast-silver pendant, and not thin cut sterling sheet like some. We think you will be pleased with the weight and quality. Please keep in mind that not all font or symbols are available on all pieces. Check the description of your desired item(s), and if you have any questions, just let me know.